Notes: Halton station was situated on the Birkenhead Joint Railway’s (BJR) Warrington and Chester line which had opened on the 31 October 1850. The BJR was a joint company of the Great Western railway (GWR) and the London & North Western Railway (LNWR). Mickle Trafford was a later addition to the route opening on 2 December 1889. The station was located on the eastern edge of its village namesake just over 3 miles from Chester. The station was on an embankment and was accessed from Station Road (which passed under the line to the north of the station) by a sloping driveway that connected to the north end of the down platform (Warrington direction). Both platforms were constructed from timber. The down platform had the booking office which was housed in a simple single storey timber hut. A waiting room and toilets were also provided. On the up platform there was a similar but smaller building that housed a waiting room. The up platform was linked to the down by a foot crossing at the northern end of the station. Mickle Trafford was not provided with goods facilities. Fifty yards to the south of the station located on the up side (Chester direction) of the line there was an LNWR & GWR Type 1 signal box constructed from brick. Although the BJR line was used by express passenger services they did not call at Mickle Trafford which was served by local trains. The December 1895 timetable showed seven trains in each direction Monday-to-Saturday. No trains called on Sundays. The July 1922 timetable showed six up and eight down trains Monday-to-Saturday as shown in the table below. On sundays there were two down services but nothing in the up direction. On 1 January the LNWR was grouped into the London Midland & Scottish Railway (LMS) and the line became a joint railway of the GWR/LMS. Running parallel to the BJR line at Mickle Trafford was the Manchester and Chester route of the Cheshire Lines Committee (CLC). Their line ran to the east and had opened through Mickle Trafford on 2 November 1874 and they had opened at station at Mickle Trafford on 1 May 1875. The CLC station was to the north of Station Road. There had never been a connection between the two systems even though they ran very close to each other. The outbreak of the Second World War on 3 September 1939 created a demand for a connection. A junction was installed between the two lines which opened on 4 October 1942. To create the junction the up platform at Mickle Trafford station had to be demolished and relocated to the south of its original position creating a staggered platform station. The new up platform, which stretched to the Mickle Trafford signal box, was connected to the down platform by a foot crossing that ran from its northern end to the southern end of the down. On 1 January 1948 Mickle Trafford became part of British Railways [London Midland Region] (BR[LMR]). So too did the CLC station. The 23 May to 25 September 1949 timetable showed a very sparse service. Mickle Trafford was not well used and BR[LMR] withdrew the passenger service on 2 April 1951 (the former CLC station having been closed on 12 February 1951). The station was demolished after closure leaving no trace. On 7 August 1969 the 1942 connection was closed. The Mickle Trafford signal box was closed on Sunday 7 September 1969 and a new box was opened which was also called Mickle Trafford. It was located on the site of the original up platform. The new box was a BR LMR Type 15 all wood structure. It was equipped with a second hand 35 lever frame. On the same day the 1942 connection reopened but as a single track line. On Sunday 5 October 1969, to facilitate the closure of the former CLC line from Mickle Trafford to Chester Northgate to passengers (it was to remain open for freight as part of a through route to Sealand), a connection was put in that allowed CLC line passenger trains from the Manchester direction to join the former BJR and enter Chester by that route. CLC line trains started to use the new connection on Monday 6 October 1969. At a later date this junction was altered to create a Scissor Junction allowing trains to access both lines from both directions. In the early 1990's the junction was altered again as route to Sealand was closed completely. In 2016 the line remained open for goods and passenger services. British Railway Companies, C Awdry, Guild Publishing 1990. 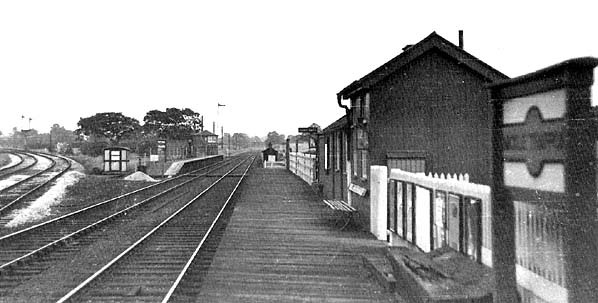 Mickle Trafford station looking north-east in 1910. Staff from the station are seen posing for the camera at the south end of the down platform. Mickle Trafford station shown on a twenty five-inch scale map from 1897. Two stations are shown on the map. The BJR station is the one seen to the left. The station seen to the right was the CLC facility. Mickle Trafford station shown on a 1950 map. The map shows the junction between the former BJR and CLC lines that was added in 1942. 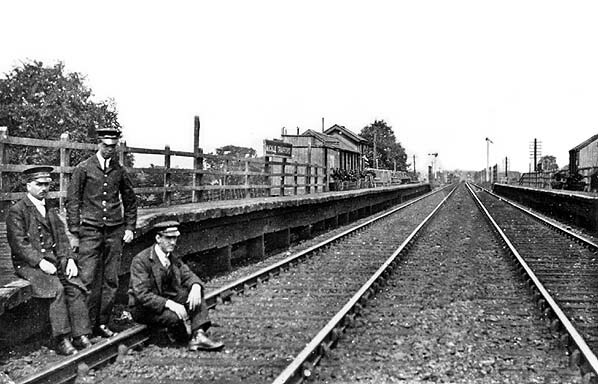 Mickle Trafford station in 1949 looking south-west along the down platform towards Chester. The 1942 junction is seen to the left. The installation of the junction required the up platform to be relocated to a point further south. The relocated up platform is seen in the distance. A view looking north at the site of Mickle Trafford station in September 1979. 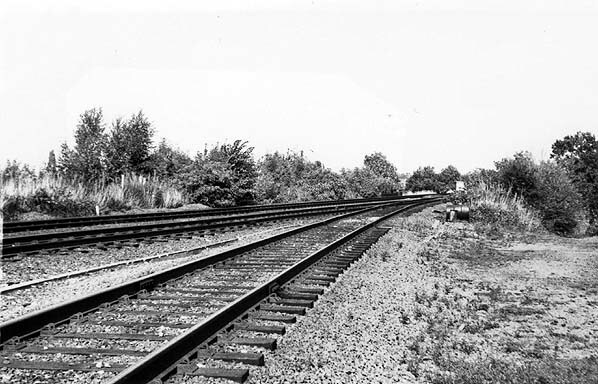 The line in the foreground formed a connection between the former BJR route and that of the CLC. Laid in September 1969 it followed the course of the 1942 connection. The site of Mickle Trafford station looking south-west on 14 October 2005. In the foreground is the disused former junction to the CLC heading towards Chester. 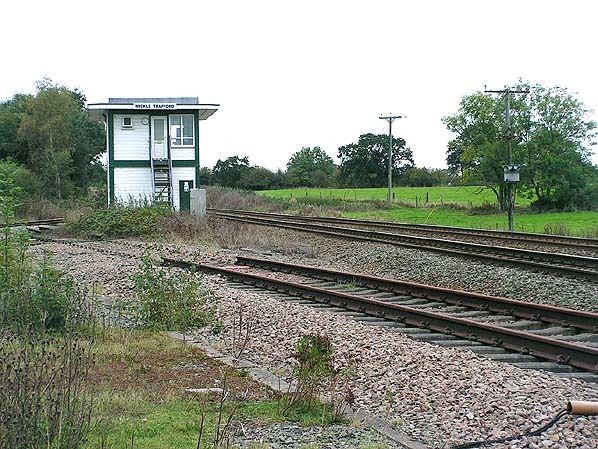 Behind the signalbox is the October 1969 connection that linked the CLC and line to the BJR. The signal box seen in the view opened in September 1969 and stands on the site of the original up platform.